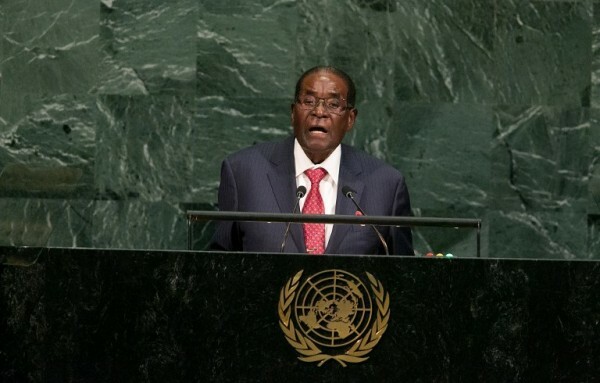 Zimbabwe's President, Robert Mugabe did not mince words at the United Nations (UN) on Thursday about Donald Trump, mocking the US president as the "Giant Gold Goliath." Addressing the UN General Assembly, where reproaches of other leaders are generally less personal in tone, the 93 year-old veteran leader took Trump to task both on policy and appearance. "Some of us were," Mugabe said, pausing for emphasis, "embarrassed, if not frightened, by what appeared to be the return of the biblical Giant Gold Goliath." "Are we having a return of Goliath to our midst, who threatens the extinction of other countries?" he asked, triggering applause in the hall as two junior US diplomats listened expressionless. "And may I say to the United States president, Mr. Trump, please blow your trumpet - blow your trumpet in a musical way towards the values of unity, peace, cooperation, togetherness, dialogue, which we have always stood for and which are well-writ in our very sacred document, the Charter of the United Nations." Trump stunned longtime UN watchers on Tuesday by threatening from the podium to "totally destroy" North Korea, describing its leader Kim Jong-Un as "Rocket Man." Mugabe has tense relations with Western nations which have imposed sanctions to press for more democracy in Zimbabwe, where he has ruled for 37 years. In his UN address, Mugabe voiced particular concern over Trump's plan to withdraw the United States from the Paris accord on climate change. Mugabe urged cooperation "in order to halt the inexorable march towards the destruction of that upon which our own existence depends."